Laser vision correction may significantly improve your vision and decrease your need for corrective lenses if you are nearsighted, farsighted, or have astigmatism. This safe, effective, fast outpatient procedure has helped millions of people around the world over the last twenty years. Our doctors can help you determine if you are a good candidate for refractive surgery. Cataracts interfere with light going through the lens of the eye, causing blurred or dimmed vision and other symptoms. Cataracts can cause serious difficulty in everyday activities such as driving and reading, but outpatient cataract surgery can remove cataracts and restore clear vision quickly and safely. If your eye exam shows that you have cataracts, our doctors will help you decide if this procedure is right for you. Through our participation and leadership in professional organizations and training programs, we know the area’s most respected doctors in every eye care specialty. 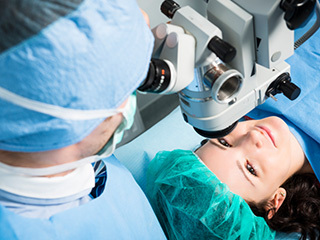 If you need eye surgery, we will refer you to the best surgeons in the St. Louis area. We will also provide your pre- and post-operative care for cataract surgery and laser vision correction.